The term 'summer movie' usually pertains to the big, loud blockbusters released from the May to August period. However, it also can denote movies set during the season itself that depict the distinctive joys and annoyances of those warm days of school vacation, family trips and bright sunshine. 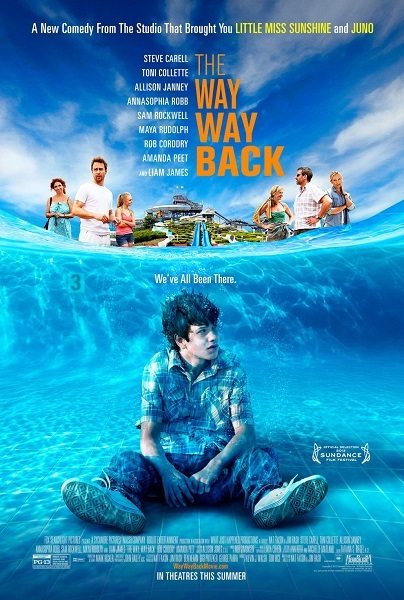 The Way Way Back is a fine little example of the second definition and of that smaller subset within it, the summer coming-of-age story. Co-directed by Nat Faxon and Jim Rash, Oscar-winning co-writers of The Descendants, the movie mines some of the same territory as that film, particularly familial alienation and a male central character trying to figure things out. In this case, it's über-awkward teenager Duncan (Liam James), who finds himself reluctantly dragged along on a trip to the seaside vacation home of Trent (Steve Carell), the obnoxious new boyfriend of his divorcee mother Pam (Toni Collette). Duncan, who suffers from a crippling lack of assertiveness and a near-total inability to communicate with anyone, particularly people his own age, seems doomed to a summer of isolation and embarrassment until he wanders into a nearby water park run by the irresponsible but personable Owen (Sam Rockwell) and his oddball staff, among whom he begins to find an unexpected sense of belonging, even developing the courage to pursue a halting relationship with the neighbor's daughter Susanna (AnnaSophia Robb). Faxon and Rash's screenplay does a decent job of capturing that especially uncomfortable period of teenage life when you're too young to know exactly where you're going but old enough to feel the weight of adult expectations and become aware of their shortcomings. Indeed, between Duncan, Susanna, her ocularly-challenged brother Peter (River Alexander) and Trent's vapid daughter Steph (Zoe Levin), a strong theme of the film is the emotional defenses children build to endure the damage inflicted on them by their parents. At the same time, there's also a pleasing optimism on display here; we often share Duncan's dread at being forced to interact with others, certain it can will end in cringe-inducing humiliation, only for the situation to move in a surprising direction. However, the script does feel a bit spread thin by its ambition, as Faxon and Rash seem determined to cram in as much as they can in their depiction of this one pivotal summer in Duncan's life. As a result, the relationship between Duncan and Susanna and the strained social politics of the parents often seem shortchanged to focus on less-important antics at the water park. As the film opens, Duncan is so glum and self-effacing as to almost be intolerable. Like many of the film's characters, he clings to threadbare hopes, specifically that he'll be able to stay with his father soon and escape the toxic atmosphere of his mother and Trent's relationship. James gives a commendable physical performance, allowing us to slowly watch his pronounced, defeated slouch and awkward fidgeting fall away as Duncan begins to grow in self-worth. His initial interactions with Susanna also capture the agonizing humiliation of what might be termed 'Bridget Jones' Syndrome,' that painful skill of saying just the wrong thing in a given situation and make it exponentially worse through efforts to repair the damage. His relationship with Owen brings to mind the bond between Chris Makepiece and Bill Murray in the first Meatballs film. Rockwell is the film's secret weapon, effortlessly riffing and tossing off quips with the kind of relaxed confidence that Duncan is utterly lacking in and expressing bemusement at how immune Duncan seems to be to his humor. Their relationship in encapsulated in their very first nonverbal interaction, as Duncan rides in the back of the family station-wagon and shyly stares out at Owen driving behind them. When he becomes aware Duncan is looking at him, Owen doesn't react negatively as Duncan seems prepared for him to do but instead gives a friendly nod, illustrating the ready acceptance of others that marks his character and suggesting he's had a lot of experience being the odd one out himself. That said, the script is careful to make sure that Owen is never held up as a role model or ideal father figure for Duncan as the increasing frustration experienced by his employee/girlfriend Caitlin (the always great Maya Rudolph) reveal his shiftlessness and stubborn lack of maturity, traits Owen can't seem to overcome. His lack of initiative and the attitudes of his employees also bring up what might be the film's dominant theme: the dangers of passively accepting your situation. Caitlin makes a passing comment about how her job at the water park was supposed to be only a temporary gig and yet she's allowed herself, like many of the others, to become trapped there, expressing a desire to leave and do more with her life but never actually doing so. With his ever-present cloud of self-defeat, this seems the path Duncan is being pushed down initially. He's clearly miserable and made to tolerate plenty of abuse but doesn't seem at all motivated to actually do something about it at first. It's not hard to see how that path has been laid out for him since it's a situation that applies to the other adults as well, particularly Pam. Collette is a pro at playing moms struggling to connect with troubled children and gives subtle clues that Duncan's awkwardness may be a trait inherited from her, as her efforts to tell a funny anecdote at a dinner with Trent's hip beachfront friends crash and burn painfully. We sense she recognizes the limitations in her relationship with Trent but hides from them, having concluded that finding someone who's interested in her at this point in her life is the best she can hope for and seemingly unaware that allowing herself to stay relatively comfortable in this situation is driving Duncan away from her. It's also nice to see her reunited with her Little Miss Sunshine co-star Carell, who finally breaks free of the sad sack/clueless loon dichotomy of his filmography thus far to play a truly loathsome human being. Trent is the worst kind of hypocrite, the type that thinks his passive-aggressive form of emotional abuse is helpful. He urges Duncan to get out and try to socialize, which we can't deny is something he needs to do, but the condescending way Trent expresses it makes clear he's not doing so out of some ignorant form of tough love but instead a resentment toward the baggage his new girlfriend brings. He needles Duncan constantly, holding him to standards and rules that he doesn't make anyone else abide by or even conform to himself, and demands respect while pointedly not offering any. It's to Carell's credit that despite all this, Trent isn't the cartoon monster he might easily have been depicted as but emerges as a genuine portrait of the type guy every child from a broken home dreads his mother will bring one day home. Robb is quietly attractive, distinguishing Susanna from Steph and her shallow beach bunny friends through a sullen loneliness that makes it plausible she'd be drawn to someone like Duncan; his lack of conversational ability finally giver her a chance to talk to someone, even if it's about the most insignificant things. We also get some good turns by Rob Cordry and Amanda Peet as Trent's ever-present and clearly miserable pals and Allison Janney as his obnoxiously talkative neighbor, unpleasant in a way that feels all-too-genuine. Perhaps the best sign of the film's success is its skill at capturing the mood of summer, that bittersweet period of fun that must inevitably end, while simultaneously expressing both the melodramatic anguish and exuberant joys of those tumultuous teenage years. I couldn't help feeling a wave of nostalgia at all the little details Faxon and Rash get just right. Perhaps it's for this reason that even as The Way Way Back never strives to cover any new ground, it succeeds as enjoyable, comfortable entertainment, the cinematic equivalent of sipping a cool glass of iced tea on a warm summer evening by the beach.